Oh how I love to decorate the holiday themes, This sugar free flag cheese pie was so delicious you would never know it's sugar free. Now that my youngest son has diabetes, we are making more and more desserts that are healthier. Who knew healthy could taste this good? A Festive Flag filled with a healthy diabetic friendly filling! Every year I try and make the holiday table as festive as possible. This year I decided it had to be sugar free since my youngest son developed diabetes. I can't wait to see his face light up with his favorite sugar free cheese pie. You could even do this crust less. I prefer to make a thin wheat crust ( recipe at the bottom). The filling is easy to whip up and fast to put together. Either way it's the perfect sugar free center piece to celebrate the day. Anyone can make this easy sugar free cheese pie! You don't have to be a baker at all. The easy instructions to make this super simple Flag shaped pie just requires a rectangular glass or metal pan. You can even use a throw away pan and make clean up a breeze! Easy as can be and a healthy choice! Low carb keto sugar free recipes don't have to be tasteless. 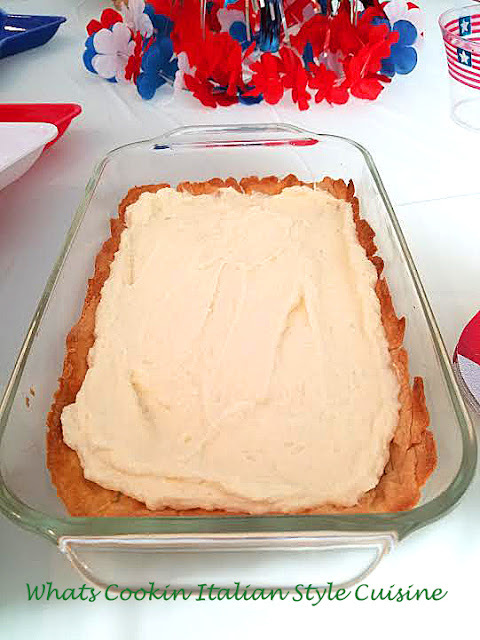 This Sugar Free Flag Cheese Pie is not only delicious and healthy it's super simple to make. It's so pretty and festive, no one wanted to cut into it! Place the blueberries in the corner in a straight line. Sliced strawberries all over the top of the rest and add the stripes and stars pie crust baked. 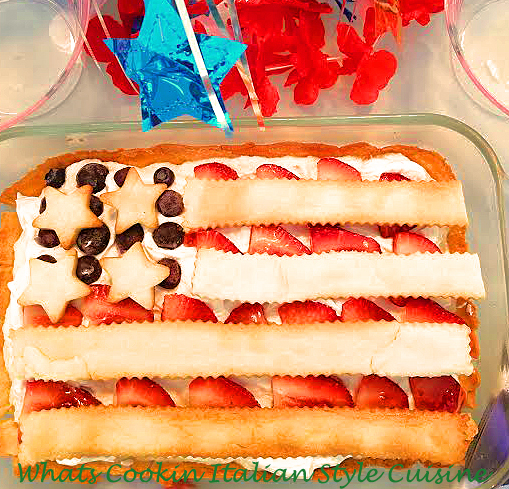 I used strips of pie dough made with wheat flour and used a cookie cutter star for the stripes and stars on top, cooked separately. I will post the wheat flour crust below or you can use store bought pie crust for the decorations. I also make a 3 ingredient Keto Peanut Butter Cookie you may want to try. Mix all together and refrigerate 30 minutes. Roll out to fit a small rectangular pan for a bottom crust and bake until browned at 350 degrees. On another sheet pan lined with parchment, roll out the dough and cut long strips with a fluted edge pastry cutter and also cut out stars with small star cookie cutter ( I used a small appetizer star cutter). Bake on parchment until browned at 350 degrees hot oven. Cool dough strips and stars. 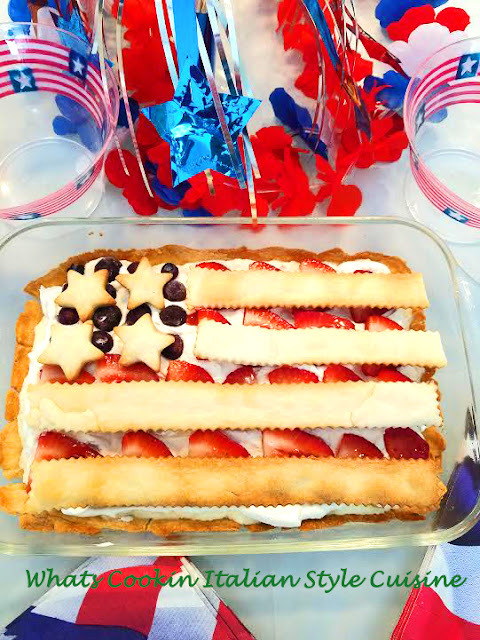 Place blueberries and strawberry sliced fruits as shown in photo on the filled pie, then add the cooled stars and stripes. Beat the cream cheese, sweetener, zest from the lemon and vanilla until smooth. Fold in the whipped cream. Pour over the cooled crust. In a separate bowl beat the heavy cream still soft peak, adding the sweetener if you like. Pour on top of cheese filling. Perfect for the holiday!!! And so festive!! !